A couple times last year, as you may recall, I created Fabric Beaded Necklaces from a variety of vintage scarves and fabrics. I took these with me to a couple craft fairs and then put in my CTStudios shop. A couple sold at the art/craft fairs, and although they garnered a lot of views in the shop, their were no further sales. I've been thinking about these for awhile ... along with the charm and fabric bracelet items in my shop. I mostly think that they are out of par with what I create. They were a fun little sidetrack, but largely not what I'm about, or what I create. So, I decided to just get rid of them and then I wouldn't have to ponder the thought any more. Kind of like one more act of downsizing, I suppose. and then ..... I was thinking that the other thing on my list today was to get a box ready to ship the Big Blue Rose Vase to my sister. And, just like that, the answer. 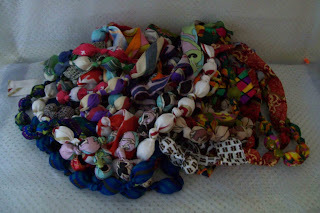 I took all these sweet little fabric beaded necklaces (that, honestly, probably went out of style in the 90s ... I'm always just a little bit out of date) and stuffed them into the Vase! I'll send most of them to my sister. (She is a psychologist at a Veterans Home (Men & Women), and I thought, perhaps, she could give them out to some of the ladies when they were in need of some cheer ... or give to her local Goodwill, or whatever. I put two in my closet ... perhaps I'll wear them someday, and I put two in Lilly's future dress-up box. Whew ... closed up the box and felt so accomplished .... one more act of downsizing and no more seeing something in my shop, that really doesn't belong there.